We’re thrilled to be partnering with the United State of Women Summit to bring together 5,000 women, girls, and allies who are committed to finding solutions to gender inequity at the #USOW2018, with speakers such as Michelle Obama (Former First Lady of the United States), Tarana Burke (Founder of the 'me too.' Movement), Jane Fonda (Actor and Activist), and Dara Baldwin (Senior Public Policy Analyst, National Disability Rights Network). Below are a few of our Diversability community members who will be attending! "I want to encourage teen girls with learning challenges. I want to be a role model they can look up to that has learning challenges. I want to tell them they can do anything they put their mind to. I would love to share my story with people. But I also would love to learn from role models who made it big. My biggest role model will be speaking. I would love to hear her speak." "This summit is filled with so many inspiring women! Personally, I know attending the event would make such a positive impact on me. As a chronically ill entrepreneur, one of my life goals is to educate others and erase any sort of stigma that comes with chronic and invisible illnesses. Surrounding myself with powerful women who are currently breaking down barriers in all sorts of life fields would only further this momentum I have created and run with over the last 3 and a half years of owning my own business! I’d love to connect with more like-minded people who are fighting and being the change they wish to see in the world." "I am super interested in attending #USOW2018 though the lens of young women with disabilities. My daughter is 19 years old and has autism. Unfortunately, the resources and educational support that have been available have been awful and her teen years have been a real struggle for her. The resources just aren't there for young women like they should be and there is a tidal wave of young women and girls behind her who need support and resources. 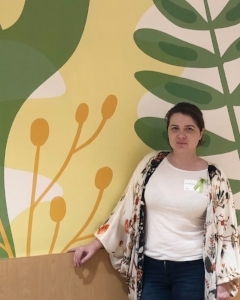 I did all the artwork for the new mental health unit [at the Children's Hospital of Orange County Mental Health Inpatient Center] to help create an engaging and inviting space that definitely does not look like anything you've ever seen before in an inpatient mental health unit." "#USOW2018 sounds incredible. My work is largely focused on activism and the past two years I have been doing more and more public speaking - in high schools and at conferences etc. I try and attend as many of these types of events as possible as an audience member to see what I can learn to empower my own voice and those of people around me, how I can make myself into a better activist and public speaker and see how combined voices and action can really make the difference." If you plan on joining us in Los Angeles this May, you can find more information at theunitedstateofwomen.org (feel free to list Diversability when prompted so the organizers know we sent you).